Wichita Eagle article, Dec. 28, 1887. The Kelly family owned a ranch about ten miles from the town of Oak City in Seward County, Kansas. From all accounts, they were a respectable family--father William, mother Kate, and their children Bill, age 20, and Kit, age 18. Being along the main road, travelers through the No Man's Land area of Kansas would often stop at their ranch for some food and a place to stay. 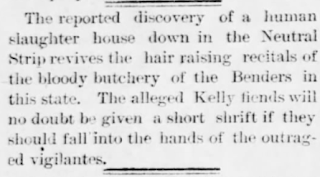 In December 1887, the Kellys suddenly disappeared, abandoning their ranch and left for parts unknown. Shortly after leaving, a group of men searched the ranch and found in the cellar ten bodies in various states of decomposition. 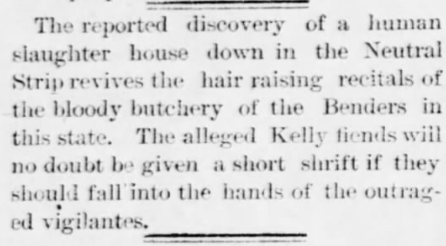 Modeling their mode of killing off of the Bloody Benders of Labette County, the either William or Kit, a fairly attractive daughter, would engage the traveler while Kate would fix dinner. At the appropriate time, a spring would be released to a trap door sending the man into the cellar where the family could rob and then kill him, if the fall hadn't done that already. It was believed that the Kellys were heading for Mexico with their riches and a posse was quickly formed. Unlike the Benders, the Kellys were caught up to. A skirmish occurred about 50 miles south of Oak City. Kate, Bill, and Kit were killed there--either shot or hanged depending on the account--but William was able to get away. Three hours later, the posse caught up with William and, after a quick gun fight, was strung up in a tree. He confessed to his and his family's crimes of robbing and killing nine men and two women. The posse strung William Kelly up in the tree again and then waited until he was dead. 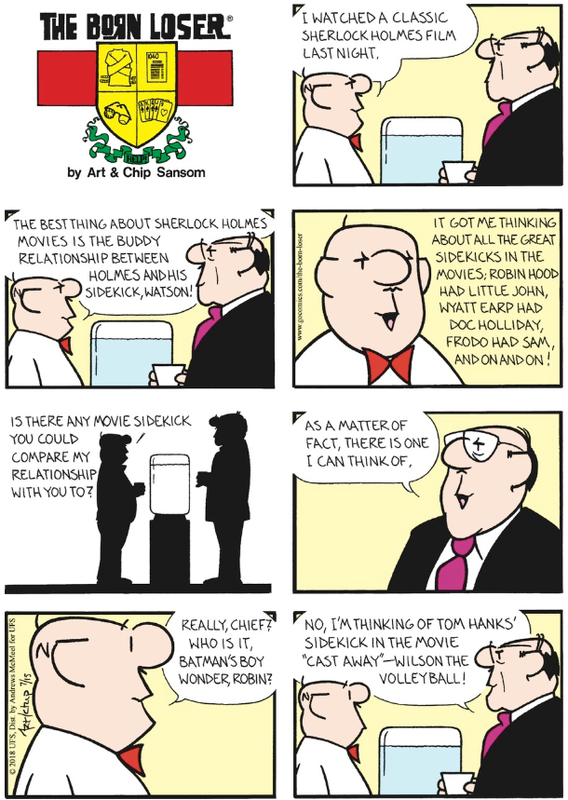 Why did Brutus immediately go to a crime-fighting superhero duo? It's bad enough he mentioned those other duos. Honestly, if I had to choose from this list, Brutus and Veeblefester are definitely Frodo and Sam and which is which depends on where in the movie you are. If you would like to support my writing and research, you can buy me a cup of coffee on Ko-Fi.